Here’s one way to understand how hot the Westside real estate market has become. In 2013, a partnership between Frank Buonanotte, founder of The Shopping Center Group, and Jeff Stein, founder of Stein Investment Group, began redeveloping an ironworks from the 1940s on nearly 1.6 acres along Howell Mill Road. They spent roughly $6 million to buy and redevelop the aging property at 1085 Howell Mill Road, just west of Interstate 75. They landed Barcelona Restaurant and Wine Bar. Later, first-to-market sushi restaurant O-Ku, first-to-market home furnishing store Dixon Rye, and new-to-market lunch spot Tom + Chee joined the development. Holler and Dash, a fast-casual concept developed by Cracker Barrel, then replaced Tom + Chee. The project, known as Westside Ironworks, is now 100 percent leased. Buonanotte and Stein put the 19,066-square-foot project on the market this year for $13.1 million. Although no official price was released, it just sold for about $14 million, or more than twice what the partnership initially put into the redevelopment, according to people familiar with the deal. 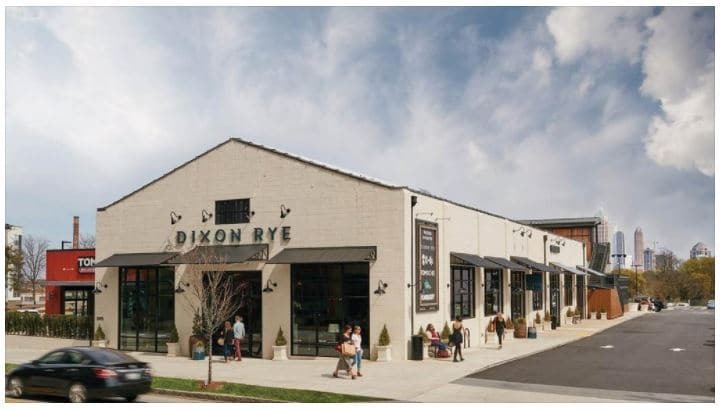 The sale is one of the most eye-popping retail transactions for intown Atlanta this year, based on its price of more than $700 per foot. The buyer was Ironw orks Westside, LLC, led by investor Sergey Khotimskiy. “I think the area has been extremely hot for a long time,” said Buonanotte, who declined to discuss the sales price. Newmark Grubb Knight Frank’s Eva Horton and Jacob Minkley represented the partnership, including an intermediary for Columbus Loop Associates, in the transaction. Chris Carter and Gene Rice, with Vantage Realty Partners, also brokered the sale. The first building on the Ironworks site was developed in 1943. Horton said the adaptive-reuse project has worked, in part, because it combines the old with the new. Howell Mill, particularly west of Interstate 75, didn’t become hot overnight, but over time its most successful projects have followed a proven formula: blending the trendy with an appreciation for the area’s industrial roots. Arguably the project that started the transformation a decade ago was Westside Provisions District. Located next to the Ironworks site, Westside Provisions is filled with tenants including including Lululemon, J. Crew and Free People. It sold last year for almost $130 million. The area continues to redevelop, with Georgia Tech recently picking a developer for a planned $140 million project at 14th Street and Howell Mill. It would target rapidly growing startups for new loft offices surrounded by stores, housing and a boutique hotel. At 11th Street, Allen Morris Co. plans to redevelop the Star Iron and Metal Co. scrap yard, a $210 million project would include a mix of offices, apartments, restaurants and possibly an organic grocer. At 10th Street, Atlanta Humane Society is selling its longtime headquarters. At 10th and Brady Avenue, Westbridge Partners’ Stockyards Atlanta is a 135,000-square-foot adaptive reuse of the last remaining historic buildings in the Miller Union Stockyards district. Many intown corridors are transforming, as more people move back into the city compared with previous decades. What’s making Howell Mill’s conversion work?